Run your business 30% faster, leaner & smarter. Boost your efficiency with NetScribeTM, the world’s most sophisticated transcription workflow management solution. 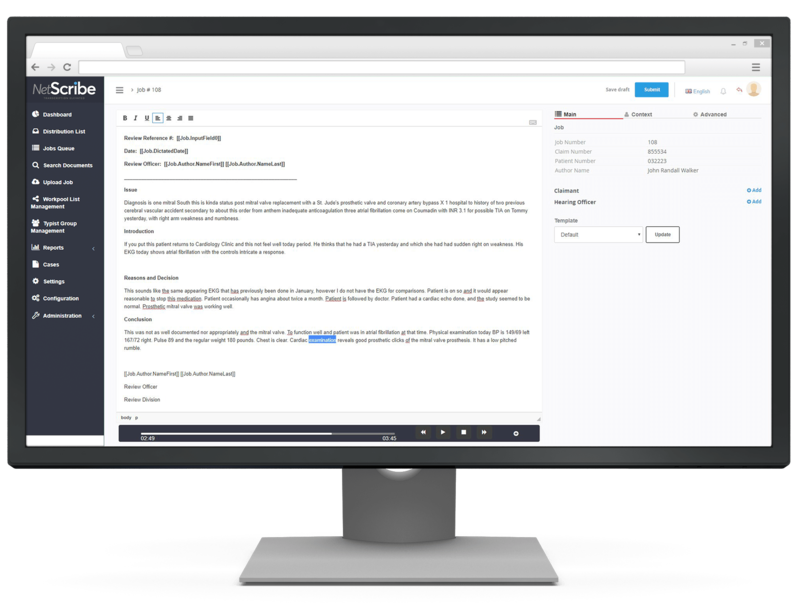 Your unified, automated platform that handles everything from audio joining & splitting to letting you edit right inside your customer’s template. Elevate your daily transcription tasks with aiAssistTM. 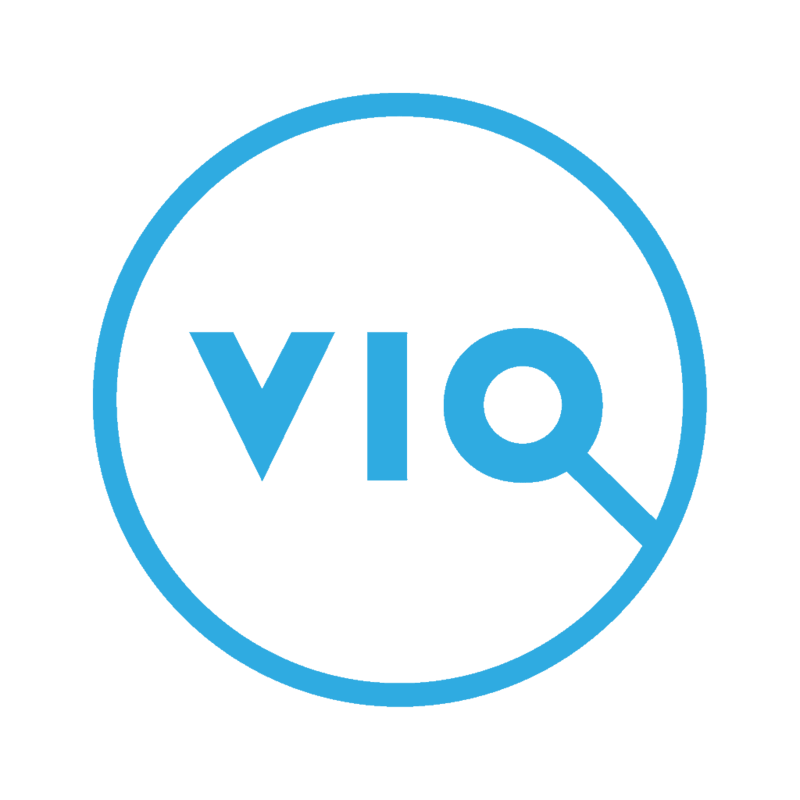 VIQ’s leading speech-to-text engine lets your team focus on editing and QA, to give your customer the best result. 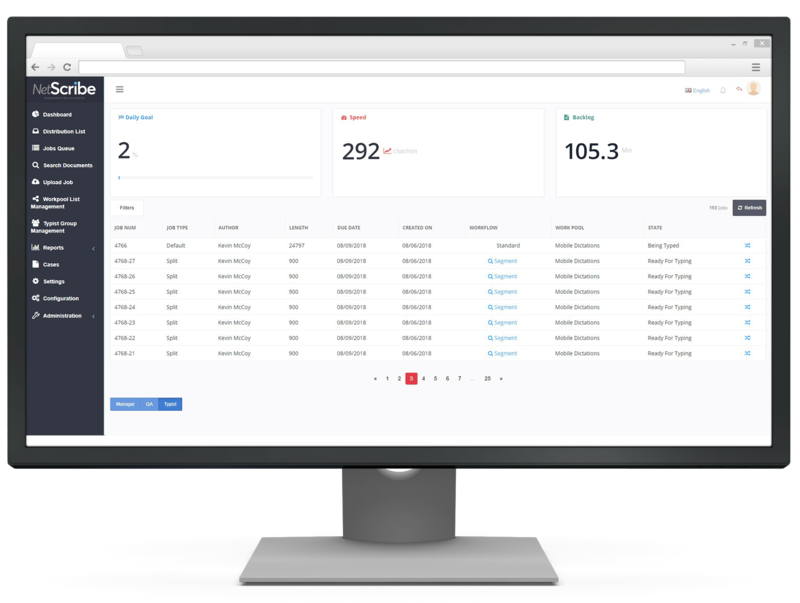 Read on to discover the many ways NetScribeTM helps your business run faster and smarter. See every job with one look. Edit any job with one click. NetScribeTM lets you view every job in your workflow, all in one place. With one click, you can drill down to view or edit details such as status, priority, or author. Similarly, one click to re-assign, re-flow, or release. With NetScribeTM, every aspect of your workflow can be tailored to each of your customers’ needs. That includes routing rules, typist pools, content & delivery templates, billing profiles, and more. After this one-time setup, everything happens automatically, and all in one place. From audio splitting, through typing & editing, to audio joining and uploading completed jobs. 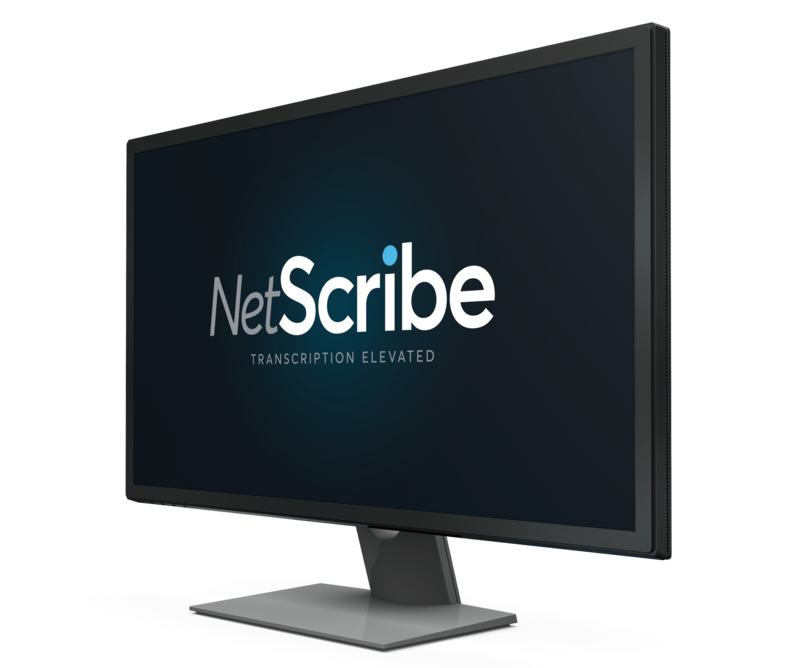 NetScribeTM brings remarkable efficiency gains to your transcription business, letting you do more and go further. Simplify and automate billing & payments. During initial setup of Billing & Pay Profiles, we’ll work with you to set up pay rates, units and cycles. We’ll also help you set up custom profiles for your customers, as well as for transcriptionists and editors. You have the choice of counting by words, lines or minutes. Additionally, billing can be broken down into sub-groups within a customer’s organization. Plus, you get options for handling white space, special formatting, and header & footer content. 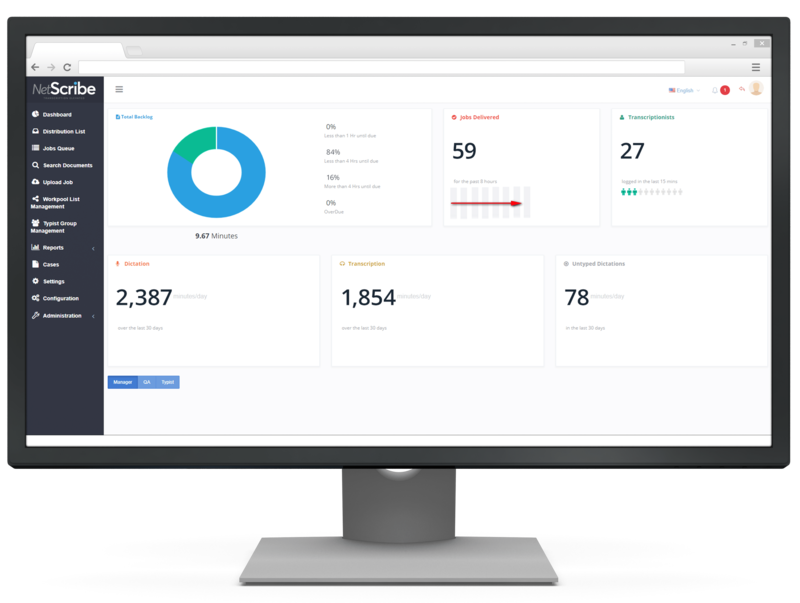 Finally, NetScribeTM calculates billing automatically for every job tagged to your customer’s billing profile. Take on short-timeline, high-paying jobs with confidence. Only NetScribeTM gives you Automated Rip-n’-Stitch, an audio splitter software tool. The tool automatically divides audio into segments for distribution among two or more typists. Once typing is complete, the same tool acts as an audio joiner to automatically pull the segments back into one document for QA to review. As a result, the automation dramatically reduces time spent in pre-processing jobs for distribution between two or more typists. Simply put, reducing overall transcription time lets you guarantee same-day delivery. Turn peak volumes into a breeze with speech-to-text. 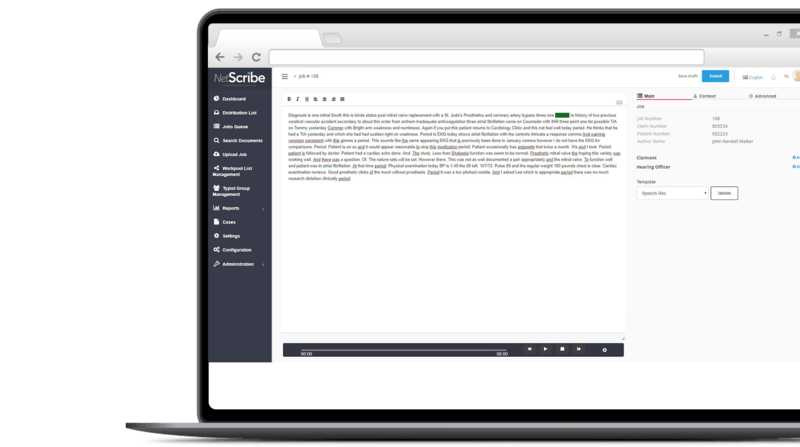 With aiAssistTM, your NetScribeTM platform also becomes an enhanced speech-to-text conversion engine. Using state-of-the-art speech recognition, NetScribeTM powered by aiAssistTM accurately converts audio to text by recognizing non-speech noise and silence. At first when the audio is unclear, aiAssistTM will suggest the most likely alternative or best choice words with the highest probabilities. Over time, aiAssistTM learns and your speech-to-text conversion becomes more accurate. The accuracy of audio to text conversion is further improved by custom linguistic & semantic models that have been developed by VIQ for specialized applications. aiAssistTM lets your team focus on QA and editing – and maximizes your yield in record time! Gain more with custom templates. Once your customers’ templates are configured, they are available to your team. From there, typists and editors can work directly within pre-formatted content templates. What’s more, NetScribeTM can automatically populate information such as reference numbers, case files, and author names. Also, shortcuts known as Jump Points speed up your navigation by allowing a user to skip through sections. If needed, a hotkey reference is always just one click away within the same window. When completed, NetScribeTM takes care of merging the job into your customer’s delivery template to produce the final result. 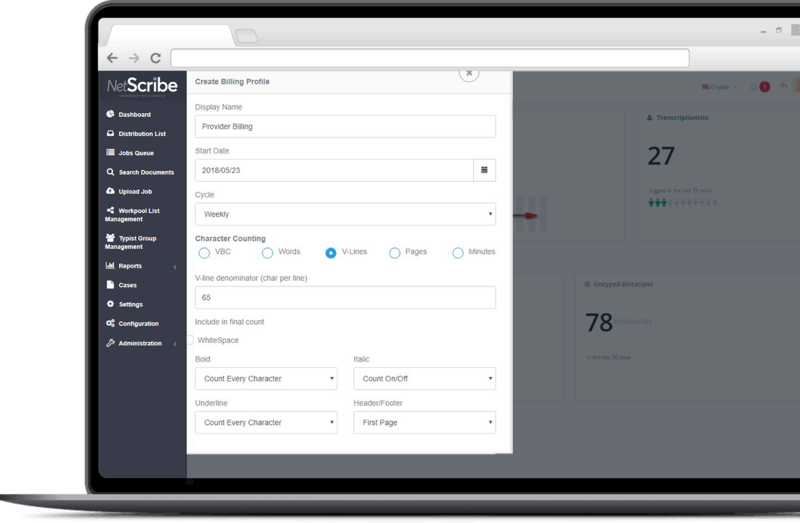 To sum up, NetScribeTM reduces steps and streamlines processes in your transcription workflow to deliver impressive efficiency gains to your business. Start running your transcription business faster, leaner and smarter today!